A 100% organic superfoods combination powder - one of the most nutrient-dense organic superfood combinations per serving you will find! It is packed with vitamins, minerals, antioxidants and powerful phyto-nutrients (including chlorophyll) from the 15 organic superfood ingredients (which include wheatgrass, pre-sprouted barley, kelp, quinoa, acai berry and more)! High in vegetable-source proteins, this powder blend also contains over 20 natural enzymes and 70 beneficial nutrients. 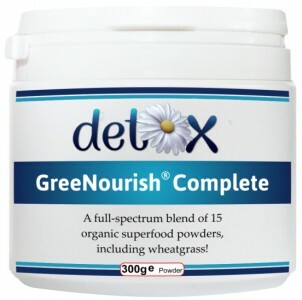 Allergy advice: There is a small amount of gluten in GreeNourish Complete, found in the green barley. 1 - 2 scoops, 1 - 3 times per day or as required (1 heaped scoop is around 10g). Scoop is included with each tub. To be mixed with water, fruit juice, soya milk, rice milk, almond milk, vegetable juice or other liquids. Ideal and tasty as a smoothie.